A University of Arizona professor on a Fulbright research and teaching fellowship to India was selected by the Fulbright Foundation to help facilitate orientation sessions for scholars interested in opportunities to conduct their research abroad. Melissa A. Fitch, a University Distinguished Professor in Latin American Cultural Studies from the Department of Spanish and Portuguese in the College of Humanities, is uniquely suited to assist scholars in both India and the United States in joining the longstanding educational and cultural exchange program. Not only is Fitch a repeat Fulbright recipient, but her research deals with how — in a time characterized by global shifts in power as well as global flows of people, commerce and technology — we come to understand the cultural "other." Through a focus on the global webs that spread information, Fitch examines how meaning is created, sustained, transformed, challenged and accepted. "Popular culture — my area of research specialization — appears innocent or harmless, but it will often present unexamined assumptions about other cultures or peoples, something that can be at best problematic and at worst dangerous," Fitch said. "These ideas usually reinforce the superiority of the more powerful country in the equation. In the past, this was the United States, but increasingly it encompasses the various countries of the emerging economies, including China and India." Researching the circulation of cultural touchstones across the globe is what brought Fitch, who since 2002 has been editor of the academic journal Studies in Latin American Popular Culture, to Asia — first to Hong Kong on a Fulbright award in 2011-2012 and now to India as a Fulbright-Nehru Academic and Professional Excellence scholar. "Specialists in Latin America have traditionally studied the region either unto itself, within specific countries or in relation to neighboring nations, or they have viewed the region exclusively in terms of the United States," Fitch said. "I examine the global reach of Latin American and U.S. Latino popular culture within the world's two most populous countries, China and India, as well as in light of globalization, transnationalism and the rise of social media." Professors currently on a Fulbright grant, such as Fitch, have much to impart to other scholars preparing for their own overseas research trips. The Fulbright Program, founded in 1946 by J. William Fulbright, became the U.S. government's flagship international educational exchange, an effort to encourage global understanding focused on our common humanity, as opposed to dwelling on the differences that separate us. Former Fulbright fellows include 57 recipients of the Nobel Prize, 70 MacArthur Foundation Fellows and 82 recipients of Pulitzer Prizes. Thirty-seven Fulbright alumni have served as heads of state or government in countries around the world. 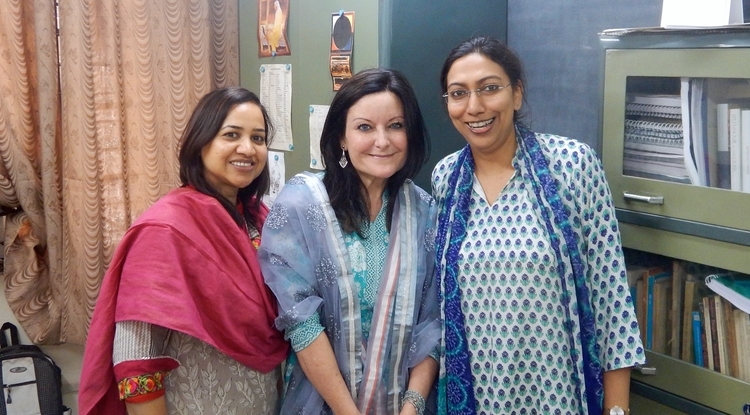 "We selected Professor Fitch as a resource person for her extensive experience in Asia, Europe and Latin America and her deep understanding of Indian and American culture," said Sudarsan Dash, senior program officer for the United States-India Educational Foundation, which administers the Fulbright in India. Fitch's orientation work for the Fulbright Foundation had four components. First, she spoke in April to potential Indian scholars who wanted to come to the United States, talking about how to apply and why, fielding questions and working to ease any concerns the potential Fulbright scholars might have. Next, she assisted a group of already-selected Indian Fulbright scholars as part of a two-day orientation program, giving lectures on what they can expect to experience in the United States, on campus and off. She also was on a panel evaluating Indian universities that were interested in joining the program by hosting U.S. Fulbright scholars. Lastly, Fitch was selected to be part of a webinar directed to U.S. scholars interested in pursuing a Fulbright in India, giving advice on the application process and talking about her experience. Although she has given 14 lectures on her research since January at colleges and universities around India, as well as in the countries of Bhutan and Singapore, Fitch said, "I'm convinced I have learned far more from my colleagues and students than I ever imparted. ... This is what the Fulbright experience is all about, the give-and-take educational process that is required for intercultural understanding. It is about questioning assumptions and digging deeper." "Professor Fitch's research is representative of the groundbreaking interdisciplinary work that our faculty is taking on all over the world," said Alain-Philippe Durand, dean of the College of Humanities. "The College of Humanities is recognized as the expert and premier campus location for internationalization, study-abroad leadership and intercultural competence." The campus application deadline for the Fulbright U.S. Student Program is Sept. 6. For details: http://us.fulbrightonline.org or contact Emily Kotay, scholarship adviser in the Office of Nationally Competitive Scholarships, at 520-621-0162 or emkotay@email.arizona.edu.